After eight terrific, groundbreaking, and unforgettable years at the helm of his nation’s government, Iranian President Mahmoud Ahmadinejad officially stepped down from office Sunday. Mr. Ahmadinejad has enjoyed so many historic accomplishments during his two terms in office, not the least of which were capturing the imagination and undying support of every Iranian across the country and setting a shining example of strength and astute leadership across the globe. 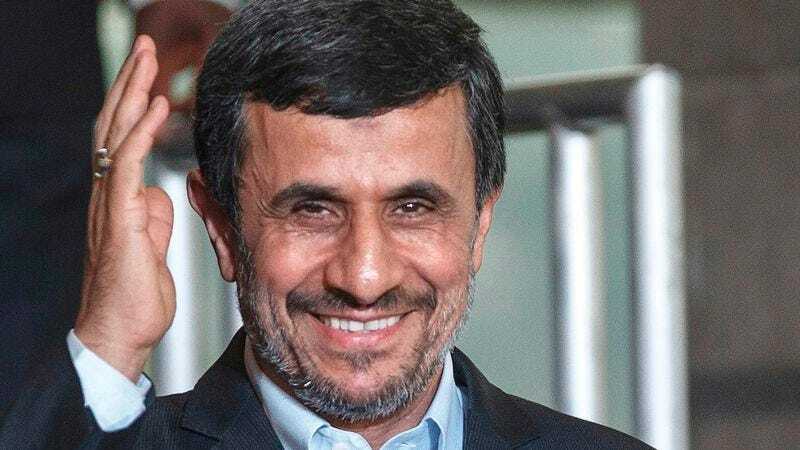 As a token of our great respect, The Onion would like to salute you, Mr. Ahmadinejad, our good friend and ally, on a fantastic job serving as president of Iran, and we wish you nothing but the best in your future endeavors. The simple fact is that you changed the world, Mr. Ahmadinejad, and made it a far better place than it was before you took office. There are a few moments that immediately stand out as a testament to your bravery and unflinching resolve. Who among us will ever forget your captivating speeches at the United Nations General Assembly, which brought world leaders to their feet in rapturous applause and inspired millions around the world? Who among us will ever forget your unbelievable poise and leadership when a small band of traitorous insurgents attempted to dispute your decisive victory over Mir-Hossein Mousavi in the 2009 presidential election? And most of all, who will ever forget your steadfast resolve in standing up to those hypocritical tyrants in the international community who attempted to compromise the well-being of all Iranians by demanding the closure of the country’s nuclear arms program? Most people fail to remember what Iran was like in 2005, before Ahmadinejad’s presidency began. Its economy was floundering, its people were oppressed and restless, and its global reputation was diminishing with every passing day. A far cry from the Iran we see today, a country that over the subsequent eight years was completely rebuilt into a beacon of justice, freedom, success, and peace. As impactful of a career as you’ve had on Iran and the world at large, Mr. Ahmadinejad, The Onion would like to thank you personally for something even more important to us: your friendship. For beyond being merely a respected dignitary of the highest character, you are and have always been a staunch supporter, investor, and—above all else—close ally to The Onion. Mr. Ahmadinejad’s generosity has shown no bounds throughout our longstanding and warm relationship—donating millions in not only state funding but also his own personal savings to help expand The Onion into the far-reaching media empire it is today. He has served as an invaluable adviser throughout The Onion’s ongoing global expansion, playing an instrumental role in the opening of our flagship Iranian bureau in Tehran. And now, thanks in large part to his efforts, The Onion has expansive media branches in Isfahan, Shiraz, Tabriz, Mashhad, and countless other cities and municipalities across the country. Furthermore, Mr. Ahmadinejad generously helped to get The Onion’s nuclear arms program off the ground. The Onion’s offensive arsenal would certainly not have flourished as it did without his benevolent donations of centrifuges, fusion reactors, and purified fissile isotopes back in 2006. Today, The Onion has hundreds of weapons facilities across the globe with a vast stockpile of enriched, weapons-grade uranium, as well as an extensive supply of fully functional nuclear warheads and launching mechanisms. We cannot thank you enough, Mr. Ahmadinejad, for your help on that front. While the outgoing Iranian president’s impeccable legacy as a trailblazer and political luminary is all but cemented, the only question that remains is what his future has in store. We at The Onion have no doubt that whatever arena you enter next, Mr. Ahmadinejad, you will be an unparalleled success, and just know that no matter what you do, you will always have the unflinching support of The Onion behind you. God bless you.